If you're like me and you love feel good TV then you have probably become slightly obsessed with Jame Corden's segment, Carpool Karaoke. It's hilarious, right?! I mean who doesn't love to watch some of their favorite recording artists sing along to some of their favorite songs + their most famous for hits. It's made even better by the fact that they're riding in a car, relaxing, and just having fun versus putting them on a stage in lower Broadway, singing into a karaoke machine. I mean if you live in Nashville then that's probably not as appealing to you as it might be for visitors. And the same can be said for your guests. Snyder Entertainment can bring something to your next event that brings the cool factor of karaoke + comfort of your own privacy: recording booths. Similar in style to the idea of carpool karaoke but instead of relaxed and riding in the car, you're relaxed and able to sing your heart out inside of our sound proof studio quality booths. This has become one of our most requested services; ideal for corporate events, birthday parties, private celebrations, product launches, and more. Learn more about our booths + how you can reserve one for your next event below..
One or two professional sound engineer(s) outside of the booth. 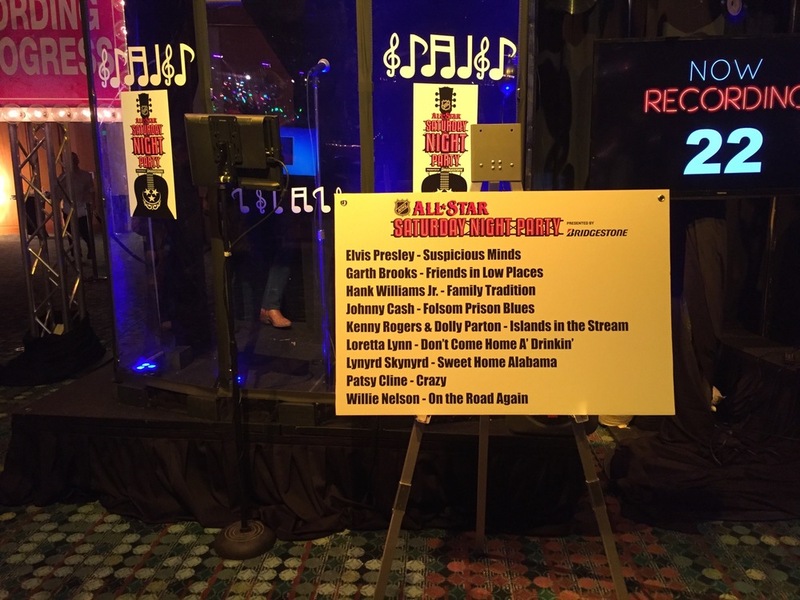 These interactive entertainment elements allow you and your guests to step inside the booth and record your favorite hits just like they do on Music Row! 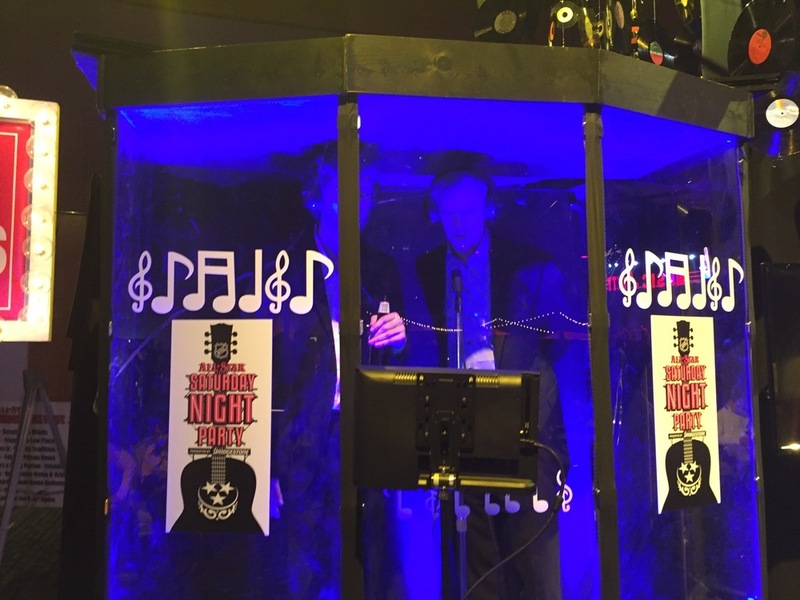 Our dual recording booths were a huge hit at the NHL All-Star after party, and have been one of our most popular + most requested products since then for private parties, corporate events, and destination vacation groups. Our open air Photo Booth for guests to use while they're waiting for their recordings to be downloaded on their memory keys. Customizing the template and backdrop to accent the studio feel as well. We could also create a true to life celebrity meets paparazzi scenario with our Step & Repeat Photography which includes a walk down the red carpet, photographers, and a custom backdrop banner. We can also create custom playlists for your event, giving your guests multiple song choices. For the digital memory keys, we can order custom designs to reflect your event. Lastly, we could set up our Green Screen in the selected venue that would help to create a true studio feel, while transforming the room; taking your guests out of a venue and into a famous recording studio on Music Row! More than your typical karaoke, Snyder Entertainment's exclusive recording booths will bring out the singing celebrity in each of us. We can't wait to see how much fun you and your guests have with it at your next event here in Music City. If you're interested in adding this fun entertainment element to your next party, contact us today. We will help you secure your date, begin picking out your playlist, and begin creating an incredible experience!